« Meet JJ Marsh – crime writer and fellow ‘Bookseller’ honouree! Readers never cease to surprise me – that’s the chief finding of the survey I ran over three weeks at the end of January/ beginning of February. I wanted to know how readers found the books they read and how they interacted with authors. It was pure curiosity combined with a sincere wish to give my readers what they want. Thank you so much to everybody who completed it! So what were the questions and answers? First, I asked what readers’ favourite genres were; although a huge range, crime/mystery/thriller, historical, romance and sci-fi/fantasy were most represented. I deliberately did not give readers a prompted choice; I wanted to see what they came up with! Read the complete list. 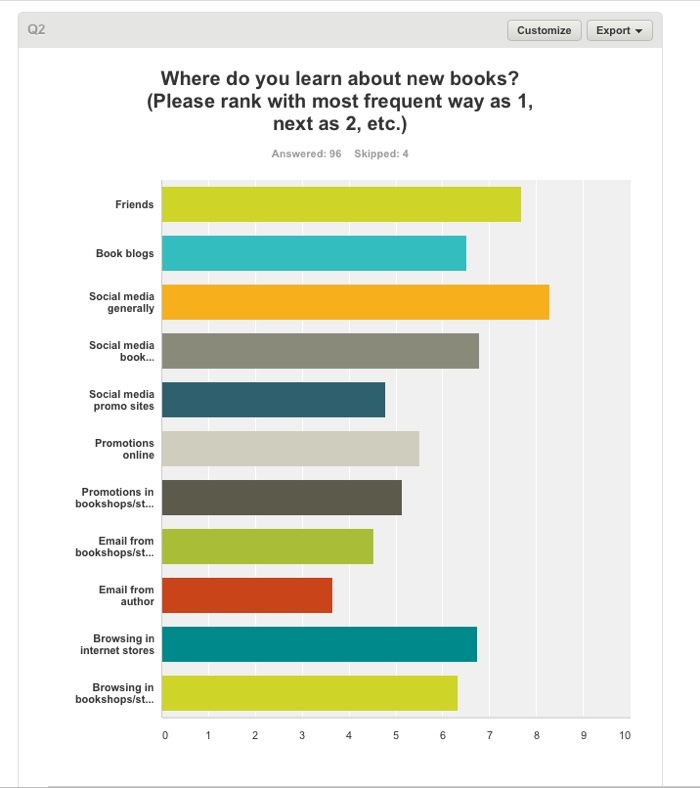 Next, “Where do you learn about new books?” Here, I didn’t include print media, only social media; perhaps this was a mistake, but it still produced an interesting result. Friends, book blogs, social media book groups/clubs, social media generally and browsing Internet stores are the main sources with email from the author as the least important. Browsing in bookshops/stores was, I’m happy to see, was also significant. On attracting a reader to a book, no surprises: cover, blurb, genre and known author, with the last two slightly more significant. I was surprised by how evenly the top four elements scored. Question 4, a very wide and open question about how much would you pay for an ebook, produced some lively comments You can read all 27 here. In general, 2.99 to 4.99 ($, £ or €) is the ‘happy’ range of prices for most readers. 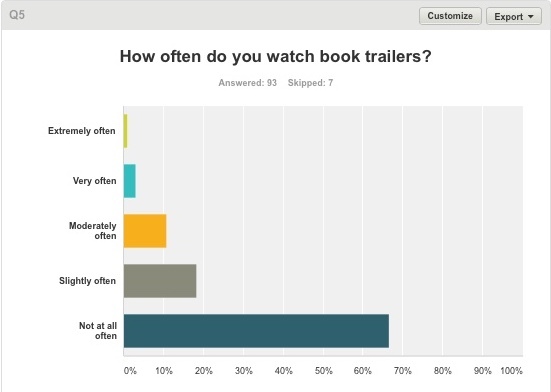 Book trailers are not watched it seems; a shame, as I love making them. Perhaps we should publicise them more? Some interesting comments here. To blog or not to blog? 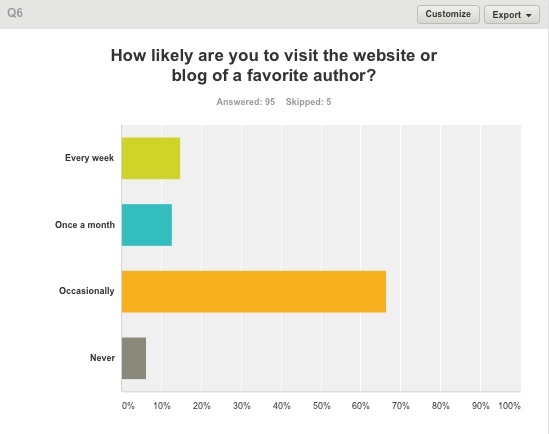 In answer to Question 6, readers seem to visit author blog sites less often than writers might imagine (or wish!). And the comments seem to back up the statistics. Perhaps we writers should write more words in our books than our blogs? 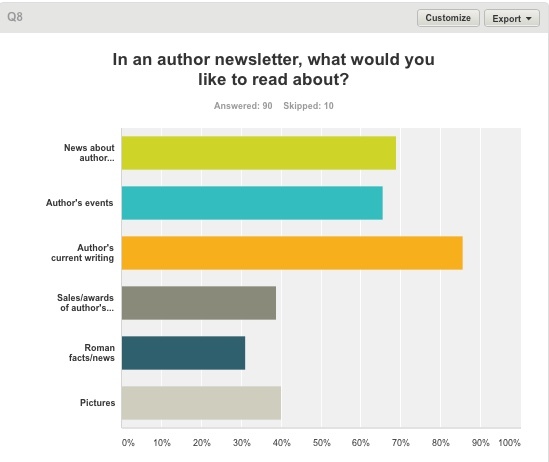 I was curious about what readers would like in a newsletter. The top three items in reply to Question 8 were: news about the author themselves, author’s current writing, author’s events and news about sales and awards. Pictures were not quite as popular as we think. 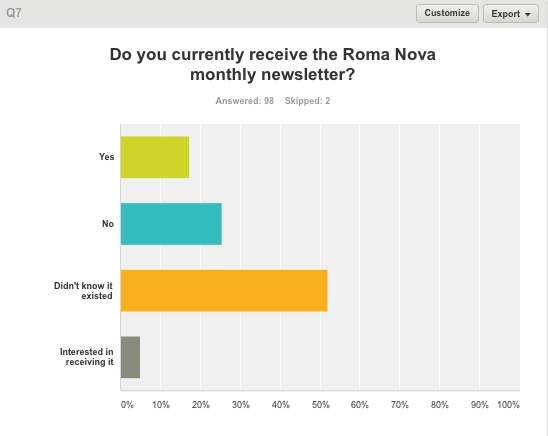 The low score for Roman news/facts was probably due to the survey audience being wider than my own readers. Challenging comments for those of use who issue regular newsletters! So where would readers leave a book review? I offered three of the ‘usual suspects’ – Amazon UK, Amazon US and Goodreads, plus ‘Other’ which was quite interesting… Authors know reviews are life-blood as they help a book’s journey in the competitive sea of publishing, but they acknowledge that reviews take a little time to write. Readers who do squeeze out some of their precious time to write some words should be awarded medals and book bloggers made saints. And lastly, for Question 10, “Would you follow an author on social media? If so which?” Facebook and Twitter won comprehensively, but “Their own blog” came a significant third. And again, the comments are worth reading! I’m not a professional marketer, so I kept it really simple. 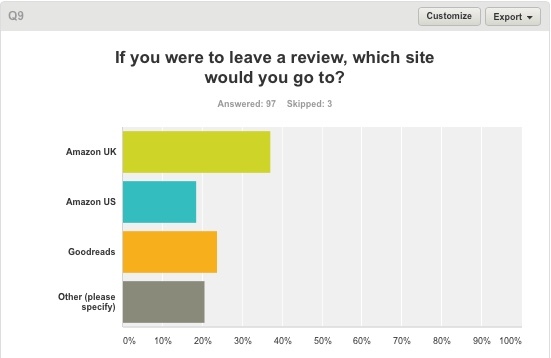 The readers were self-selecting from a spread of Facebook reader groups in the US, France and the UK, my own newsletter readers and random readers from a Twitter campaign. I used a free version of Survey Monkey which allowed 10 questions and 100 replies. Questions attracted a 90-97% response by people taking part. All links have been deleted in this report and the supporting lists. 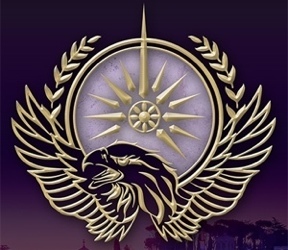 Alison Morton writes the Roma Nova thrillers, INCEPTIO, and PERFIDITAS. Third in series, SUCCESSIO, is now out. Very revealing! Readers that rock are one of the reasons we write. Great info. The pricing one was especially revealing. Interesting wasn’t it? Not just the table of results, but the additional comments. Good information to have, Alison. Thanks! Thanks for sharing this, Alison. I was surprised by the “How much would you pay?” section. Very eye-opening. And very interesting comments – a difficult subject to pin down! This reminds me that I started drafting a very similar survey for parents of children – again using Survey Monkey – and covering kids’ book apps which present double the challenge in terms of discoverability owing to how saturated the market is for them and how dire the app store is for finding them! I must look that out and get it out there! Some of the answers surprised me, Karen. I tried very hard to find a selection/variety of reader groups, so I hope I got a good spread of respondents. I’m writing my newsletter this weekend and will be applying some of this. Yes, consulting our readers is always good and strengthens the connection with them. Will be interested to see your survey! Thank you so much for doing this survey, it’s nice to see how readers feel about what were doing. 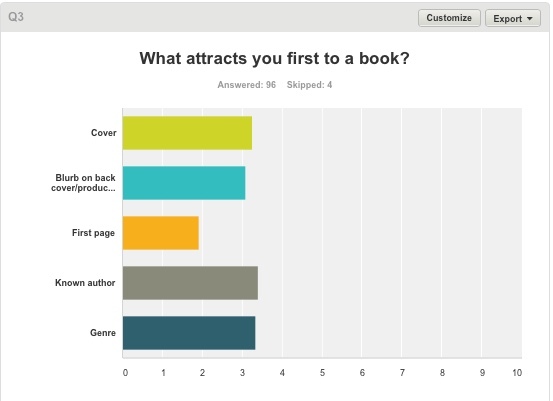 I always wondered what attracted readers to a book and how much they are willing to spend. It’s a small survey, Christina, but one which has given me a lot of food for thought. Fascinating. Lots to think about. Thanks to you and your respondents for this survey. Thanks, Martin. I’m trying to go back to all the places where I posted the survey to thank them all and let them know the results. This is really good work, Alison. Very interesting, and also reassuring that a lot of advice we give at SilverWood is based in the real world. Are you planning to repeat this survey at regular intervals? I think it could become an important barometer for what readers are thinking and doing. Thanks, Helen. An online group of writers in the US and I were just throwing around some questions we would like to ask writers so I thought I would do just that! I hadn’t thought to repeat it, but that’s certainly an idea! Some intriguing insights, Alison. Interesting about readers keen to know about the author’s current writing. Is that so they can gauge when the next book’s due out, I wonder? 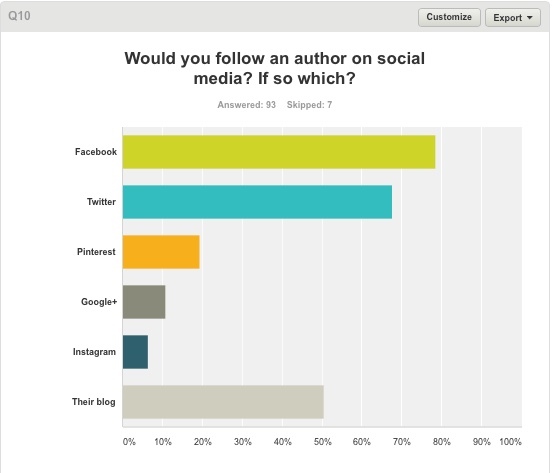 How close social media is to friend recommendation was a surprise and how people feel about ebook pricing was another. I shall dig a bit deeper now and read the comments. Thanks for sharing! I’m really grateful to all the readers who took the time and trouble to complete the survey. Now I’m going to take notice of their answers. Quite reassuring when your gut feeling is reinforced by another source! Fascinating. Thanks. I coach writers in book marketing and I do think a number of promo options are not as well used as they might be. So low like-ability may be due to poor execution rather than the promo option itself. But you can only find out by trying it and doing it well! So interesting to get readers views on these! Fascinating. Well done and keep it going. I think this was VERY worth while. It will certainly help writers target their efforts. It can’t do anything but good, John, to know what readers like and what they would like from writers. Although, I just asked myself, as a reader, how do I find my books, and what would I like to receive? Especially in newsletters, I find it much more effective not to send one every other day like marketers always recommend. (To me a newsletter list is like ‘crying wolf’. If you do it too often for stuff not relevant to the readers, readers won’t even bother opening it anymore, because they’ll think it’s uninteresting. Instead, if you make every email contain important stuff for readers (free new stories on websites, etc. ), they’ll open it and engage much more frequently.) That, however, contradicts everything I was ever told in SEO and marketing courses. It’s weird. I also often notice when talking to other authors (esp. betareaders) they put a different focus on aspects in the story. Whereas when I talk to my ‘reader’-betareaders, they don’t even care or notice what authors obsess about. Thanks for a very thoughtful comment, Kimberley. I think you’ve neatly summed it up. This is only one tiny survey in all those around, but I think it points to what really concerns readers rather than what we *think* concerns them. As you say, we need to look at how we chose our own books. On newsletters, mine goes out once a month and I think that’s plenty. I can’t be clever, witty, informative every other day and write books at the same time. And books are what readers want. The results certainly made fascinating reading. Several people seemed surprised the greater percentage of readers are willing to spend in the ‘middle range’ for an ebook, but I wasn’t. 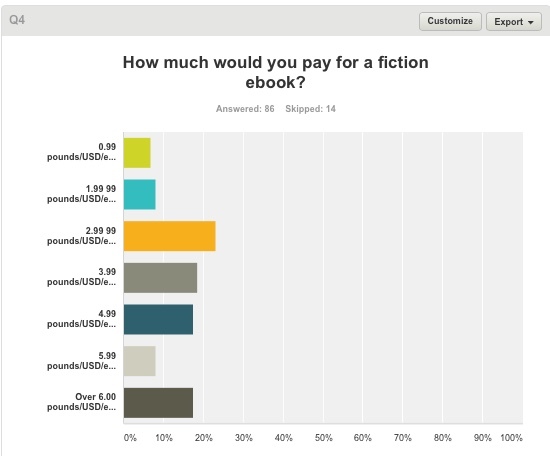 I think readers expect to pay something reasonable for a good read. Goes for most things. Anything that appears too cheap is often perceived not such good quality. Pricing is the great subject of discussion in writers’ groups. Offers and sales are good for promotions, but as you say, value and price often don’t coincide! Very interesting, thanks so much for sharing! Re Pricing. A copy on Kindle costs less than a coffee in Star*ucks, for most books. Many writers would love your answer, John! However, sometimes books are promoted at a low price to catch the attention of new readers, especially if the book is the first of a series. Thank you Alison for taking the time to do this survey. It answers or confirms questions that not only authors ask themselves but readers also wonder about. For example – Why so few comments following up on excellent articles by popular authors on Goodreads? I have often asked myself ‘Where is everybody?’ Having said that, I have noticed that some authors never bother to reply to their reader’s comments – You do! Obviously too, there are many sub standard novels within the free to 99p range of e-books.’You takes your chance’ with unknown authors. For me, I really appreciate it when my favourite authors offer one of their novels at a very cheap price as an e-book for a short period. However I prefer to pay more to obtain the paper or hard backed version of my favourite genres/authors. The short term e-book cheap offers of the same novels are a bonus. I am not keen at all on blogs where authors simply write about what they had for breakfast or where they went with family during the weekend and then add a comment at the end of the blog about their new book coming out shortly. I much prefer the sort of blog or newsletter that authors such as you send out to us. I often feel sad that so few readers do not take the time to add a comment or at least a thank you. 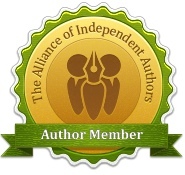 I subscribe to four top class author’s newsletters including yours – all of them well worth reading. Keep yours coming Alison. They are greatly appreciated. Leila. Thank you, Leila. I think a book is a two-way experience. 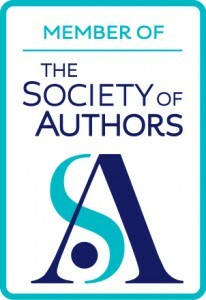 The writer slogs away, combining a story with research, giving hours to drafting and honing, using editors and other experts to produce the finished book. Thank you for sharing this interesting survey. It’s helpful to know where it might be worth focusing one’s efforts, since it’s impossible to be active on all social media all the time. One big lesson that comes out for me is to spend more time on the writing and a bit less on the sometimes unfocused sessions I spend on social media. This survey would certainly be worth repeating. Glad you found it helpful, Vanessa. You are not the only one to suggest a great survey!